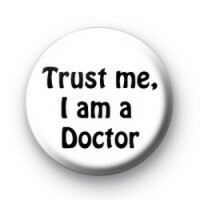 Trust me I am a doctor badge in white with black text. These badges were designed for a doctors surgery but are popular with both Academics and doctors throughout the NHS. Also popular with student Dr's. Hospitals often buy these to hand out to their staff, but they can also be worn by Dr Who fans. Standard 25mm button badge handmade in our UK workshop.